I recently responded to a request for examples of the work public libraries do to support children when they are very young - from birth to 5, the so called early years foundation stage. 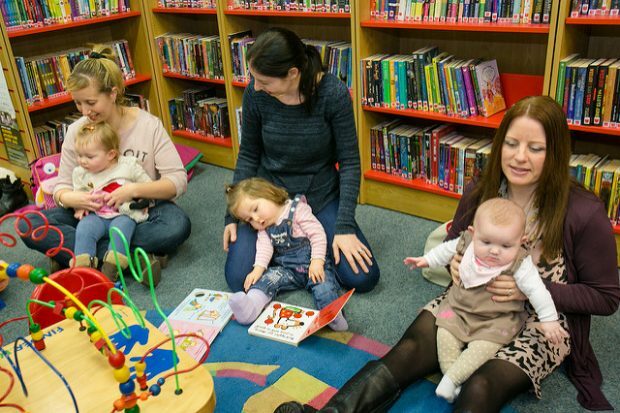 Almost all libraries run rhymetimes, baby bounce or similar, but too few attendees come along as a result of referrals from early years teams - so there is the opportunity for work to be done to make more targeted links. Below I’ve set out some initial examples of work going on currently that I’m aware of. I’d welcome any more contributions from library services - then I can use them to ensure that policymakers are better informed about the range of what you all do! Please add your examples and suggestions in the comments box at the end of this blog. Libraries Connected (formerly the Society of Chief Librarians) developed Universal Offers to help increase consistency of library offers across the country. The Learning Offer explicitly mentions rhymetimes, but there are also strong links to the Reading Offer too, which is run in partnership with the Reading Agency. The Reading Agency runs an annual activity which takes places in libraries: the Summer Reading Challenge. It is primarily focussed on primary age children, although many library services run associated activities extending the challenge by linking to early years activities for pre-schoolers. Setting this in a wider context, research from 2008 which looked at the home learning environment, laid out seven indicators which have a proven link to child cognitive development. Second on the list is: going to the library! All this is strongly underpinned by the work Libraries Connected is doing to promote family learning activities, and also by the Children's Promise (jointly developed with ASCEL, who are the professional group for senior children’s and education librarians). ASCEL have produced a number of reports which provide evidence about what libraries are doing with younger age groups: Children's library journeys (2015) includes a useful literature review and a breakdown of the contribution of libraries at different stages of childhood. It highlights various partnerships library services can use to reach pre-school children and their parents, namely registrars, health visitors and children’s centres. Various library services work in partnership with these organisations to deliver Bookstart, give out membership cards and information about library services, and deliver joint events in libraries and in partner venues. ASCEL also published a study on children's digital use and learning which gives another interesting perspective. The toolkit is flexible so users can focus on elements of all of it or use a specific tool. And the evaluation report details how the development of the toolkit was undertaken and the impact it has had on some library services and families involved. ASCEL have also looked at connections they can make with families pre-birth with their Bump Booster toolkit which is currently being evaluated by a number of library services. A scoping study was published in April 2018 that looks at rhymetimes as a contributor to maternal mental health. Amongst other things the report includes information about libraries work with early years professionals such as health visitors (where it was clear that it would be useful to increase referrals opportunities). There’s also some interesting socio-economic data about attendees; rhymetimes help with social mixing because of their very broad appeal - but they also have higher proportions of mothers from 2nd and 4th most deprived deciles than library users overall. During September 2018 ASCEL carried out a social media campaign to highlight how Schools’ Library services and public libraries are supporting the development of early speech and language in children. This generated a positive response from followers, tweeting how they encourage early reading in their households, with parents suggesting breakfast stories, reading to children whilst they are eating their dinner, and reading aloud to children until they are reading harder books than you. Our blog includes several case studies on activities library services are undertaking. Our Libraries: Opportunities for Everyone innovation fund focussed on providing opportunities for people in disadvantaged areas, and included work in Staffordshire with Ready Steady Library which focuses on Early Years foundation stages. We also published news about some collaborative work with St Helens Library Service alongside schools and early years professionals on speech and language development, and a report from Greater Manchester Libraries showed they have identified Early Years as a priority for their work, and are looking to forge closer links with other early years professionals. There is some interesting work being done by libraries in the north west, as part of a maternity vanguard project. Besides looking at maternal wellbeing it is exploring links in to child development and has established a number of cross sector working groups to extend work with libraries both regionally and nationally. Through joint working with the BookTrust and a north west regional library network Reading Matters, it's engaged with over 30 library services. The project then started to generate a regional debate about how family reading can impact positively on family relationships and a child’s development in a health and wellbeing context. Liverpool Library Service has been hosting discussions in partnership with NHS England and the STP (sustainability and transformation partnership) on what wellbeing looks like in a maternity and early years context.The project is establishing a regional infrastructure to highlight and amplify messages about access to high quality play for babies and toddlers, specifically free books through the book gifting arrangements set up via the BookTrust. 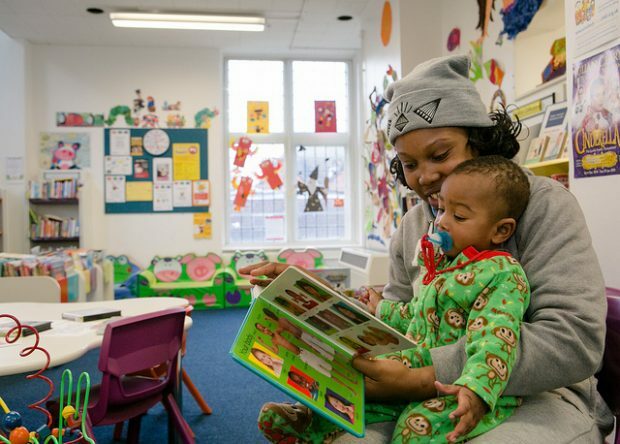 Existing partnerships between libraries, the BookTrust, Sure Start centres, health visitors and speech and language teams have helped help build social connectivity for otherwise isolated parents with their peers (close to home) and identified best practice models. We'll publish a blog on this on the Taskforce blog platform soon. As mentioned in my introduction, this is just the result of a preliminary piece of desk research. I’m sure that there are loads of other examples of brilliant work that libraries are doing. So please let me know about them!